You can view information about a digital signature, or the certificate that is used to create the digital signature, in Word, PowerPoint, and Excel. For more information on adding or removing digital signatures, see Add or remove a digital signature. For general information on adding or removing protection from files, such as passwords, restricted editing, and digital signatures, see Add or remove protection in your document, workbook, or presentation. Note: Digital signatures can’t be created or removed in Microsoft Excel Starter 2010 or Microsoft Word Starter 2010. 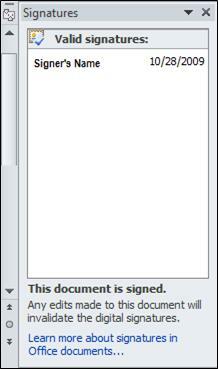 Open the file that contains the digital signature you want to view. Click File > Info > View Signatures. In the list, on a signature name, click the down-arrow, and then click Signature Details. Valid The signature is current. 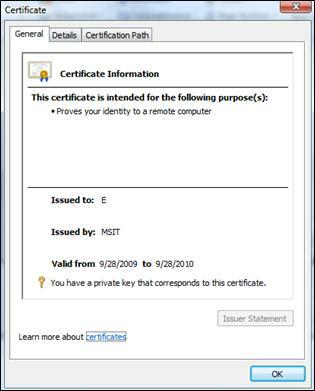 The certificate is trusted, and isn’t expired or revoked. Invalid The certificate is revoked or the content signed has been altered. Recoverable error The signature isn’t valid now but you might be able to make it valid. The problem might be that you are offline, the certificate is expired, or the certificate issuer isn’t trusted. Partial signature A portion of a file is signed. 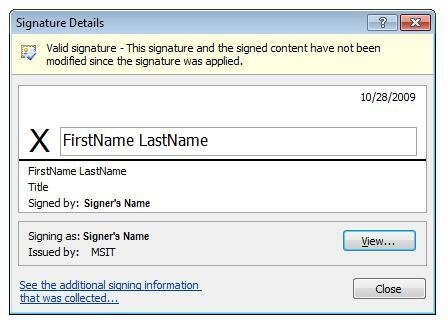 The Signature Details dialog box displays certificate information such as the signer’s name in the Signing as box, and who issued the certificate. Open the file that contains the certificate you want to view. In the Signature Details dialog box, click View. Where do you get a digital certificate?